Published: Jan. 5, 2019 at 07:42 p.m.
Indianapolis Colts running back Marlon Mack stiff-arms Houston Texans defensive back Tyrann Mathieu on a speedy 26-yard pickup. Published: Jan. 5, 2019 at 06:49 p.m. 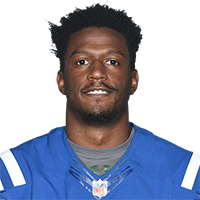 Published: Jan. 5, 2019 at 05:04 p.m.
Indianapolis Colts running back Marlon Mack runs it in for a 2-yard touchdown.